Looking at my reflection in the mirror before me, clad in the robe of an Order Priest, I never thought that this was where I would end up. I have betrayed my Lord Sheogorath. I am now an enemy of the man I once worshipped as the Madgod. He had been everything to me, just as He is everything to all of His loyal subjects, Manic and Demented alike. But now He is a man I despise. Sheogorath went too far when He allowed that outsider to come into the Realm and usurp the throne of Mania. Now I want Him to pay for what He did to Thadon, and to me, and to all that I loved. He took from me every person, everything that ever brought me joy and love, replacing it instead with fear, pain, and sorrow. He couldn’t stand the fact that my heart might love another more than it loved Him, so He took from me anyone He saw as a threat to my devotion to Him. How I didn’t see it before is almost shameful. But then, He keeps the truth hidden from us beneath the heavy and binding layers of madness which He claims is a blessing. That is the truth of the Shivering Isles. All of us that live here have been “blessed” with madness. But no longer am I bound by those chains. The blessing of Order has freed me from slavery to that prattling fool, and my mind is no longer bogged down with insanity. I have come to a place of clarity for the first time in my life. I can now see how my life might have been, if not for Sheogorath and His Realm of Madness. Had I been given the chance to steer my own course, I might have led a normal life of no consequence. I might even have been happy. Instead, I am filled with anguish, and I feel as if my heart has been torn into a million tiny pieces while it still beat in my chest. Death will come swiftly; I no longer fear it, and I will welcome it with open arms. Only in death can I hope to find peace for what I have done. But even then, I may find nothing more than punishment—who is to say? Thadon believed that when we die, we would all go to a place of perfect bliss and live together for all of eternity, never to feel pain again. But then, Thadon lived much of his life in his own false sense of bliss, a world created in his own mind with the help of his precious drugs. What a fool he was. And yet, what a beautiful soul he had. Even with all of his faults, I loved him. I still do, I guess. Our people can’t understand how a relationship ever developed between us; if you look at it from the outside, it’s easy to be shocked and confused by such an unlikely pair as Thadon and I. But one has to look much deeper, and return to the very beginning to understand. There is more to the story than what has been told, and only my heart still holds the truth of our love. Our love, conflicted by our madness as it was, was beautiful and pure. No one can understand that without knowing how it all began, and there is only one other person alive now who knows how the story goes. I began recording my story before the truth of my insane state became clear to me, and I gave it to a trusted confidant because I believe she will keep my story safely hidden away until the time is right for it to be revealed. Perhaps it never will be. One can only hope. There is more to my life than what is here and now. I’ve lived 37 years, all within this Realm, and for an elf, I’m still very young. But in 37 years, I’ve had enough misery to last me an entire elven lifetime, and I’m ready to move on—whether to punishment or eternal bliss—or, more frighteningly, to nothingness. Whatever awaits me, I will face it with courage. I have no choice. The time has come, and I must answer the call, even at the cost of life itself, if necessary. And I take with me the only remaining link to Thadon that I have. The rest I leave behind me, and I pray that my story will not be lost. There is so much to it that has yet to be told, and all of it is part of who I am and who I was before. The events in my life have shaped me, like formless clay is molded into a twisted and beautiful masterpiece by the hands of a Demented artist. Everything that has happened to me has brought me to where I stand now, and it was all beyond my control. But the things I have witnessed, and the suffering that I have endured will not go down in history. Those who survive will view me only as a traitor, and I will be reviled. But perhaps the time will come when my story can be told, and maybe then I will not be so misunderstood by all who have heard the echo of my name, trembled at the sound of my voice, and looked upon my cold and hardened face. So many have feared me. So many have ridiculed and betrayed me. And so many have seen me only as an enemy without a heart. But that is not all that true; I am not so cold and heartless as I have appeared. Like with each person, man or mer, there is more to me than what is seen on the outside. There are layers of emotion, thought, and experience that compose the depths of who and what I am. There is a side to me that was broken, and hidden away for many years. To those who truly knew me, I was a loyal friend, a doting mother, and a passionate lover. However, most people do not see the world for what it is. They see everything around them with a narrow view, and do not look beyond what is plain to see. Though I am a woman with a broken soul and a beating heart, to most I am only the Lady of Darkness, or the Mistress of Death. To them I am simply Syl, Duchess of Dementia…. Warning: I am totally insane. But I'll tell you a secret--all the best people are. Yay you made it! Welcome to Chorrol Syl. A good start to your tale. You take a character usually seen as a villain, and give us her side of things. I wonder if she will still seem the villain after we see more of her life from her point of view? Perhaps. But I am sure it will be a fun read either way. And yet another Bosmer character! With three Bosmer girls, and three boys, we completely outnumber all the other races here! How wonderful that you made it over here from Bethesda. Welcome the Chorrol Arena! Yes, another member of the wood elf clan! You have a neat premise here and I look forward to reading more of Syl. Thank you both! Yes, I am glad to make my way here, and it will be nice to see if the response I get here will be any different than the one I received at Bethsoft? From what I've seen, there are a lot more writers and readers here, so it'll be interesting to see what happens! Thanks for the invite, SubRosa! Yes, there are tons of Bosmer here. Acadian = Buffy, TheOtherRick = Talendor, Thomas "The Cook" Kaira = Derelas, Winter Wolf = Aradroth, then my own Teresa, and of course your Syl. 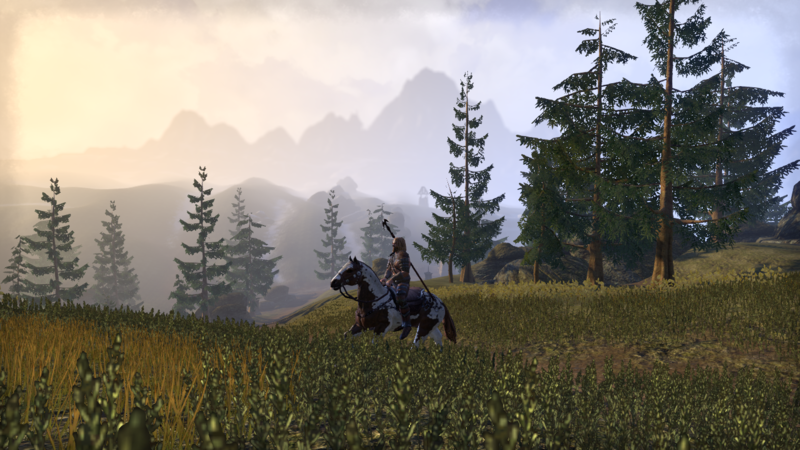 Six ongoing stories with Bosmer protagonists. Who ever would have imagined that from the race that always wins the polls for "Most Annoying" or "Most Hated"? From: Flyin', Flyin' in the sky! A most interesting start! An excellent way to respond to the question of "what happened after Jygallag was freed?" I'll be enjoying this one, I'm sure. Interesting to play it as an NPC from the game. 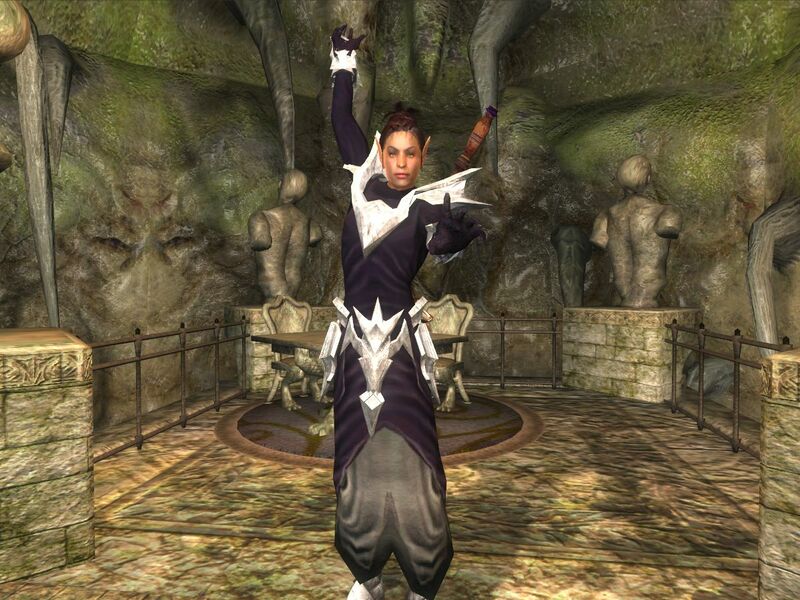 Syl rather appears in-game as a heartless umbrella seller, pardon the French, but NPCs in Oblivion rarely have very much depth. You will provide it instead, it seems. Yes, hidden within that imaginary mind of hers, I saw great depth, and being interested in psychology, I wanted to explore that psychopathic mind.... Very interesting. . . .
I�ve lived nearly 63 years, all within this Realm, but my skin yet remains mostly unlined. Well, thank you! I am glad my prologue has already made a good impact. It was my intention to grab my readers and pull them in with the subtlety and mystery of what is to come. Hopefully you will continue to enjoy. Here I am going to introduce you to Chapter One. I originally wrote it with the hope to publish (Bethesda never responded to my request, but at least I tried! 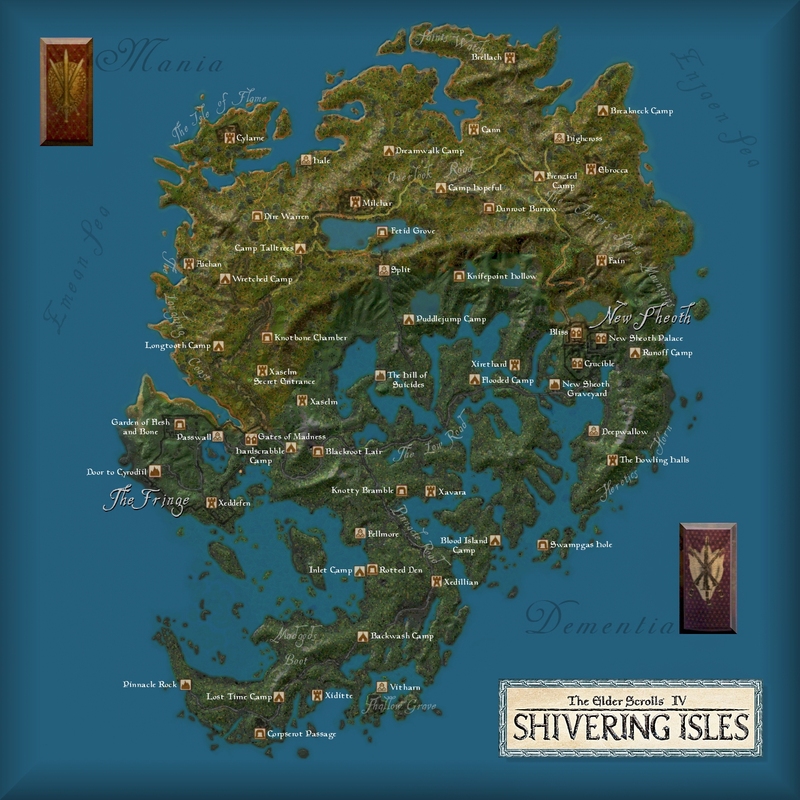 ), so in the introduction of the first chapter, I went into a great deal of description of the Shivering Isles and the Realm of Madness, with the idea that people who have never played the game might read the book, and they would deserve to have some understanding of the Realm right from the start. I will assume everyone here has played Oblivion and the Shivering Isles, though, so I will skip the greater part of Chapter One, and spare you the "niggling little details," as Sheogorath would put it. So, in the first chapter, Syl introduces us to her family and mentions some important details concerning her birth and her early childhood. There are some key events that helped to shape the child Syl and prepare her for becoming the young woman Syl. 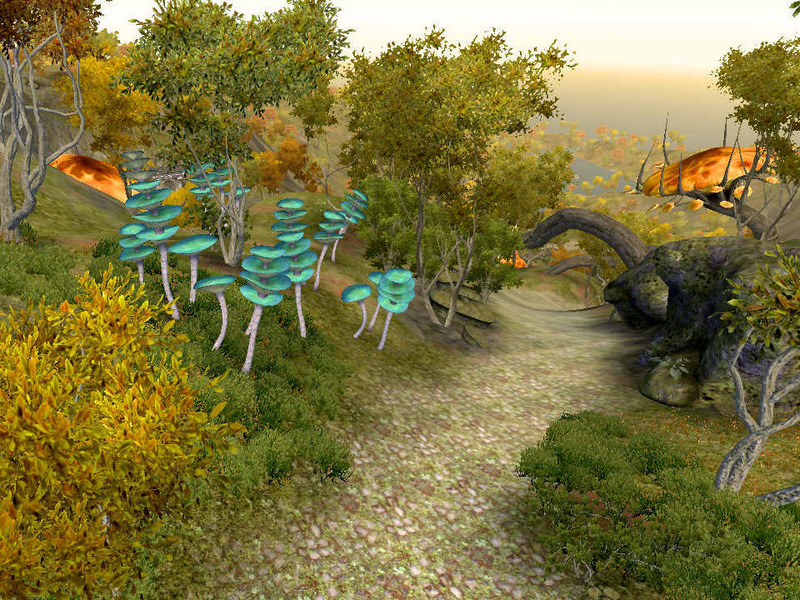 The Shivering Isles is a world like no other; a place of unsurpassed beauty and scores of adventures. 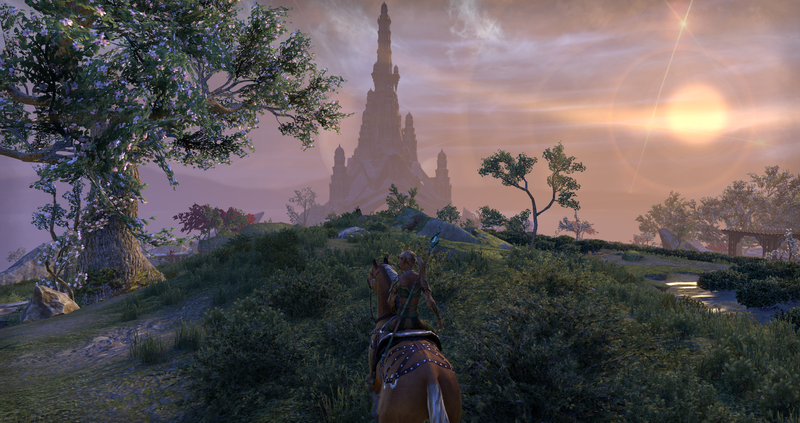 It is the Realm of Lord Sheogorath, the Daedric Prince of Madness�His creation and His crowning achievement. The Isles are, in a word, breathtaking. 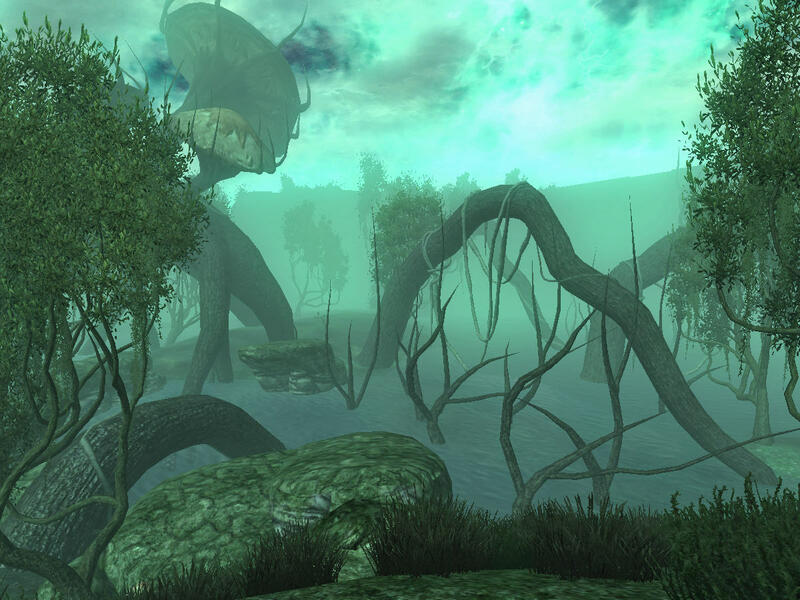 From the high mountainous lands of Mania, to the low treacherous swamps of Dementia, the Shivering Isles are filled with exotic plant-life and dangerous creatures that exist nowhere else in all the universe. With the primitive frog-like men called grummites, to the daedric monsters known as hungers, the Isles are a diverse world of men and mer, creatures and daedra, and unique flora. But with all this diversity exists little harmony, for the Shivering Isles is a realm divided. It was into this world of division and madness that I was born, late in the year during the colder months of winter. I was born to Lord Gelebor, the Duke of Dementia, and his consort, Lady Adrial, and I was given the ancient elven name Syl, which means �faerie,� because I was always very tiny, even from birth. I was told by my mother that when she first saw me the day I was born, she had remarked that I looked like a little faerie, and so my name was set. My mother was descended from ancient elven royalty, and her line could be traced back. My father had a similar heritage, but because he was born in the Realm, unlike my mother, his could not be traced. 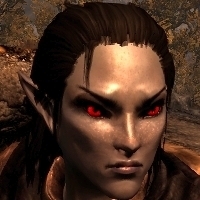 But both of them were Bosmer; Wood Elves, as we are called in the Tamriellic tongue that has become most prevalent, even in the Realm of Madness. My mother, being from Valenwood, taught me the elven language growing up, and we spoke both languages in our family life. My father, Lord Gelebor, was a subject of great confusion for me growing up; for, as kind and doting as he was to me, he could be equally cruel and hateful to others. His enemies never knew the meaning of mercy, and even his friends did not wish to displease him, for fear of facing his wrath. One of my earliest memories was of my father exacting his revenge upon a former friend and courtier who had insulted him. I never did find out what the man had done to deserve his punishment, but I clearly remember my horror as I watched the man being dealt with in the House of Dementia�s torture chamber. I was in my sixth year, curious and full of mischief, as are most elves at such a tender age. My governess had become distracted, gossiping with one of the other servants, and I took the opportunity to slip away in search of adventure. There wasn�t much to do in the House of Dementia, and even at that age, my father insisted that most of my time be taken up with studying. So, naturally, I found great joy in escaping from my rather tedious and boring duties to use my natural ability to sneak through the shadowed corridors of the palace unseen. It was my keen sense of hearing which alerted me to the agonizing cries rising up from the torture chamber�a grim and forbidding room of the palace which, up until that day, I had never seen. Alarmed but ever-curious, I could not resist sneaking down the stairs, ducking in the shadows when I heard one of the Dark Seducers on patrol nearby. When she had passed, I continued down with caution, and peered through the partially open door of my father�s torture chamber. Seeing the man in chains, screaming and crying and begging for mercy as my father did unspeakable things to him, I gasped quietly and stood there and continued watching, riveted by the horrifying scene. Never had I seen so much blood. Never had I witnessed such a cruel fate as that man�s. And never had I known that my beloved Ada was capable of doing such terrible things. It was only when I felt someone grab my tiny shoulder and pull at me that I finally managed to turn away from that scene. I let out a terrified scream, but was hushed quickly by Muurine, my Altmer governess. 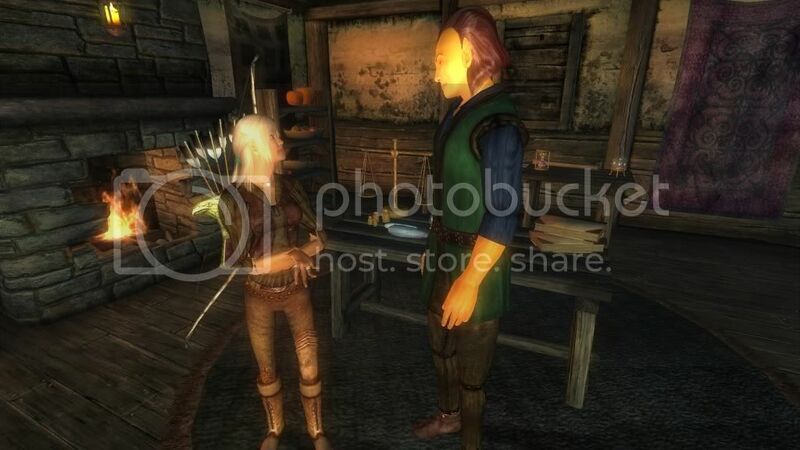 Muurine towered over me, being High Elf, and when I was a girl she had long dark hair that was almost black. As I grew up, Muurine, who was over four-hundred years old, began to lose that color in her hair, and by now she has more white and grey in it. But she is still very beautiful, and like all mer, she has aged gracefully. I have always admired her, for many reasons. Muurine was a necromancer, and my parents had given her the added task of teaching me all the schools of magicka, as well as many of the other things I was expected to learn as a lady of Dementia�s court. Necromancy never interested me, as I could never get over my disgust and fear of corpses, but I learned everything else Muurine taught me with ease. I was a very good student, and Muurine often praised me for my �sharp wit and inquisitive mind,� and my parents were very proud, though I would never become the talented mage they had hoped I would be. My first lesson in necromancy was when I was nine years old. My father had wanted me to start sooner, but my mother refused to let me be taught such things so young. Muurine took me to her house in Crucible, which she shared with her uncle, Leo, and the first thing that struck me when we entered her bedchamber on the second floor was the most horrid stench I had ever smelled in my life. When I looked around the room, it didn�t take very long for me to realize what it was I smelled�there were bloodstains, both fresh and dry, and body parts strewn about the chamber, everywhere except by the bed. I was horrified, but Muurine seemed completely unaffected by the sight, not at all surprised, and I wondered if this was what her bedchamber normally looked like. She was about to say more, but that�s when I noticed a partially decomposed corpse lying in a corner, blood all over his unclothed body. I let out the most horrified scream, startling Muurine entirely, as she had not been expecting such a reaction. �I-It�s�a dead man,� I answered, my eyes wide with shock as I pointed to it. She was completely unsympathetic to my fear of corpses, but that was not unusual in my case. None of the Demented had been sympathetic to me for it, but I had thought that perhaps Muurine would be. She had been with me from the time I was weaned, and she was like a second mother to me. In fact, I would say I was closer to Muurine than I have ever been to anyone in my entire life�even my mother. My mother, who was always loving and dear to me, often became my father�s source for relieving his frustrations, and his abuse of her haunted me painfully as I was growing up. Not a day went by when my father did not find cause to beat her, and he didn�t care who was around to see it. Even with his excuses, I never understood why he was so cruel to her, for she never seemed to really deserve such brutality. But my father was never to be questioned, and I was too young to have courage enough to stand up for my mother against his fury. It also became apparent to me then that my father was never faithful to my mother. It had never occurred to me why my mother slept with me in the chamber I shared with Muurine, instead of with my father, until the day I saw him in his private garden with one of the chamber maids. I was at an age where I still did not understand why I was not allowed simply to go visit my father in his quarters at any time, and I had not yet seen him that day, so I was eager to spend time with him. But when I went into the garden, I saw him standing before a young Breton woman with rust-colored hair. They were speaking in hushed voices, and I saw that the front of her bodice was loosened. When my father reached out to touch her cheek and began kissing her, I turned and fled, embarrassed and ashamed. I suppressed my tears and tried not to let it bother me, but it hurt me to know that my father was keeping company with the maids in the palace, instead of with his wife, my dear mother. I didn�t understand it, for my mother was a very beautiful woman, with golden hair and soft blue eyes. I always wanted to look like her, but I would never be blessed with her fine golden locks. Instead, I had my father�s brown hair, so dark it was almost black. My eyes were more like my mother�s, a soft shade of blue; but mine were more intense than hers, likely due to my passionate nature, for which I was often chided. My father was strict and he would not tolerate disobedience from anyone. He was an imposing presence, stern, and tall for a Wood Elf. Even the largest and strongest of men feared my father. His thundering voice left many terrified and trembling. His dark eyes were always cold and hard�except when he looked at me. I was my father�s pride and joy, and he loved me like no other. He was the one who always called me Syl Aranel, meaning faerie princess, and he gave me everything I desired, except the one thing I desired above all else�freedom. But he was always there for me, and any who might dare to cross me better beware. Though I had often seen my father�s dark side growing up, with me he was kind and loving, only hard when he needed to be, and never cruel. He was very dear to me, and I trusted him always. 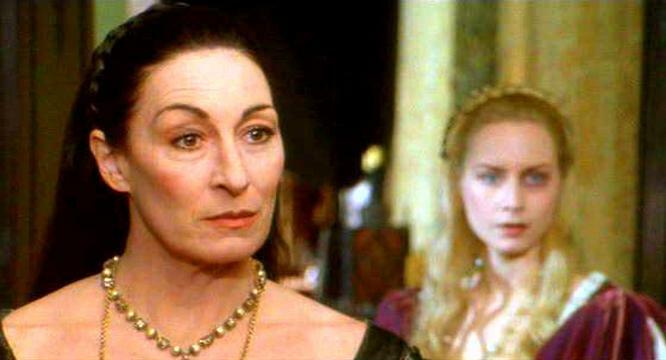 All my life I always called him Ada, which is the endearing form of the elven word for father, Adar; so, it may come as a surprise to some of you that I ever became Duchess of Dementia at all�for, the way to the throne was not my birthright, nor my heritage. It was a position given to those who had earned the Madgod�s favor, and anyone was eligible to take control of one of the ruling Houses. How I came to sit on the throne I�ll not go into now, but I will say this much�I did not inherit the throne from my father, as that never happened in Dementia. There was a lot more involved than that, and it was always very bloody. My parents did not raise me to take over as the ruler of Dementia, but I was still well-acquainted with the customs and functions of court life. I had been given every luxury available to a Demented girl, and Ada gave me everything I asked for. Perhaps I was spoiled; I have been accused of it, though I never believed it. But court life was not always perfect and exciting, as those of the lower classes might think. There was much expected of me as a proper young lady, and at times my life became quite tedious and boring, and I wanted badly to escape from it when I was younger. Even as a child, I was dressed every day in only the finest clothes, always in darker colors. The Demented have never worn anything bright, like the Maniacs have always preferred, but we do not only wear black all the time. My favorite color to wear in my youth was always crimson, the only bright color accepted in Dementia, due to its blood-like appearance; but as I�ve grown older, I�ve come to appreciate black much more thoroughly. Living as I did in the palace, I rarely ever got to play with children my own age. In fact, I hardly ever got to play at all, and I was given only half an hour each afternoon to play on the palace grounds under Muurine�s supervision. I was not allowed to have friends, as my parents were always wary of most everyone around them, but as I approached adolescence, that would begin to change. Once I started blossoming into a young woman, that changed very rapidly, and I attracted many admirers. My mother spent many afternoons with me in my quarters, and she was a light in my life for most of my childhood years. She always encouraged me to follow my heart, and she told me to never let any man control my life and take everything away from me. I didn�t understand what she meant at the time, as I was too young and na�ve to comprehend it. Because of that, I had to learn to follow her advice the hard way. It seems I learned a lot of lessons the hard way, but such is life. Muurine always said, when I would tearfully ask why things were so difficult, �what have you learned when times were good, dear?� She taught me that all life is suffering, but that suffering makes us both stronger and wiser, if we will allow ourselves to learn from it. In Dementia, such a philosophy is often taken to the extreme, as physical pain is commonly used as a means of cleansing the body and purifying the soul. It is not uncommon for the Demented to physically harm themselves; and it can be very gratifying to our twisted minds. What a powerful insight into Syl's early years !! (And into living in the Realm of Madness!) Your ability to transform words into visual images is amazing !! Great Write !!! I really enjoyed the part with Muurine and her Uncle Leo. How nice to see the groundwork for that laid so early on! Muurine being Syl's magic teacher was a brilliant idea. Likewise Syl's aversion to corpses is a good piece of character-building. It reminds me of Himmler, who nearly fainted at the sight of a mass execution. Please do not see all this as being antagonistic. I think you have some real talent. But you have fallen into some of the most common traps of beginning writers. I offer up the following critique in the hope that it will help you improve your writing. I see one major issue with most of the piece, you are telling us all this rather than showing us. You avoided it with the part where Muurine took Syl to her house, and we saw it for the first time through Syl's eyes. That was excellent showing. But the remainder of the piece is mostly telling it all to us. For example, you tell us that her father sleeps around. It would have been better to give us a scene where Syl sees a young hottie make the walk of shame from his room, still putting her clothes back on. Then he comes out a few minutes later. It is good to have all this background information in your character notes. That way you can build a cohesive, and rich, story. But think of it as an iceberg. The reader should only see the tip of it at one time. Never all of it at once. This strikes me as being strange. Why would the Shivering Isles keep Imperial Eras? Or Months and dates. We known the Greymarch happens every thousand years, and wipes the slate clean of everything. Only a few ruins remain from the time before the previous march. All history is lost, as no one in the current period even recalls that there was a Greymarch a thousand years before. It is only hinted at in one of the game books. 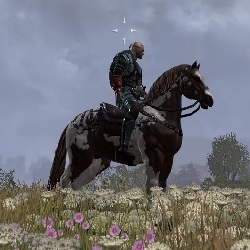 Plus since their sky is completely different from that of Nirn, it also seems unlikely that their star signs, if there were any at all, would be the same. I realize that creating an entirely new calendar is a lot of work, as well as starsigns, but perhaps it would have been better to simply leave these things out entirely instead? Crimson seems rather bright. Perhaps something more like rust, or maroon would work better? Even as a child, I was dressed every day in only the finest clothes, always in darker colors. The Demented have never worn anything bright, like the Maniacs have always preferred, but we do not only wear black all the time. My favorite color to wear in my youth was always crimson, but as I�ve grown older, I�ve come to appreciate black much more thoroughly. When I was a child, my governess, an Altmer named Muurine, would brush my hair every morning for half an hour before putting it up in a simple girlish style. Muurine was quite tall, being High Elf, and when I was a girl she had long dark hair that was almost black. As I grew up, Muurine, who was over four-hundred years old, began to lose that color in her hair, and by now she has more white and grey in it. But she is still very beautiful, and like all mer, she has aged gracefully. I have always admired her, for many reasons. The forum ate the space between your two paragraphs here. That can happen when you copy and paste from a word processor. As far as the telling, yes, I see what you mean. I guess in chapter one I'm still sort of introducing a lot that you are right about me probably not needing to do. Thanks for the tips. But I will let you know that as chapter one continues, and then through the rest of the story, /i do move away from telling the story to actually showing it. The reason I'm telling here is that I was concerned about making the story too long, and I wanted to sort of skip most of her childhood, to keep it from getting too lengthy. But Chapter Two will also cover part of her childhood, with more of the story actually being shown. The star signs--yes, I suppose it would be different in the Isles, and probably isn't necessary to have in the story. I never thought of that, I guess, and I got a little confused about whether or not the daedric realms would use such a system or not. I will keep this in mind for the future and make any necessary changes. Crimson, I guess, is not quite the right word to use for the color. Maybe it should have been more like maroon or burgundy. At the the same time, I think of crimson as being the color of blood, which is why it would be acceptable to the demented, but perhaps I should have worded that differently, then, to explain this. Tell me what you think of the changes? mALX: Thank you for the compliments. I am glad you have enjoyed it thus far, and I hope you will continue to do so. That does look better. I looked back through the books you can find in the SI, and I found that not one ever mentions years, months, or dates. So Bethesda went to a lot of trouble to avoid the issue. Rather painfully so in some cases. You might consider going back and completely re-writing that post, and perhaps some of the other ones with more telling. One of the blessings to migrating to a new forum is that it gives you an opportunity to do some retooling. Both Acadian and I took full advantage of this when we brought out tales over here from the Beth forums. Sometimes removing large chunks of the old story, and other times adding on even larger pieces of entirely new material. Mine probably doubled in size when it came here, given all the new stuff I added. But even the old parts all got reworked. Thanks to that, it is a much better story than it was over at Beth. It is your story though. So while I might offer advice, it is only advice. Do what you feel is right for the story. Your name is at the top after all. Well, if no one minds the story getting a little longer, I don't mind adding more to it. I was trying to keep it short before only because of my original intention to publish. But I suppose if it's not being published, I can expand on it. There are many ideas I had already, but the fear of making it too long for Bethesda to want anything to do with it had me trying to shorten it. I would love to do a reworking of it, as you said, and I think I will take advantage of it. Thanks again for the advice. Make it as long as you want it to be. The great thing about writing on a forum like this, is that you can write for its own sake. Not only is it personally satisfying, but it is also wonderful practice. My own writing has improved dramatically since I started TotFS. I have seen similar improvements in many others as well. Plus, the longer you make it, the more the rest of us have to enjoy. Ooops, Foxy is going to love that line! Make it as long as you want it to be. The great thing about writing on a forum like this, is that you can write for its own sake. Not only is it personally satisfying, but it is also it is wonderful practice. My own writing has improved dramatically since I started TotFS. I have seen similar improvements in many others as well. All right, done and done! I have gone through chapter one and rewritten it, changing the order of some things, removing some things which were unnecessary, and adding a little more actual "scenes" to it. Although much of it is the same, it is better than my original. Hopefully you will agree. I've pasted it over the original above. I love the changes! I haven�t played SI, and the description you gave at the beginning set the scene for me. The snippets from her childhood really come alive now. We can feel her embarrassment and shame at seeing her Ada in the garden with the maid, for example. Thanks! Yes, after SubRosa gave me those tips, I took some time to think about how I would change it and got to work right away. I agree that it does come alive more after the changes, and I am much more satisfied with it now. After going over it again, I also noticed that before it was not very well organized--it seemed like I jumped around too much, but I used this opportunity to organize it better so it flows more smoothly. I appreciate all the feedback, and thank you for taking the time to read my story and comment on it. We learn a great deal about our little fairie here, and I can see already you have a wonderful way of working with the mentality that one might find in the isles to make it come to life. I am greatly enjoying learning about Syl. You had completed your edits by the time I read this, so I cannot compare it to the original. I will say that it does weave some 'showing' to break up the large amount of background that you cover here. I heartily agree with SubRosa that you should not be afraid to expand with detail and linger as you wish. Realize that 'showing', particularly when amplified by lots of dialogue can require a very large amount of text to cover ground. Sometimes 'telling' is effective for quickly covering a large amount of ground when required. This can be helpful if a more detailed 'showing' of the material would become tedious or repetitive. Sometimes a detailed 'showing' of a few key snips is the answer. A mix is what we generally use, but 'showing' is always the most dynamic and immersive to read. Generally you want to really rely on 'showing' for scenes that you want to be particularly powerful or memorable. I also endorse the recommendation to view your already posted elsewhere episodes as rough drafts for your current version as we are always learning and improving. Similar to SubRosa, the original 69 episodes of Buffy's story that formed the basis for what is here at chorrol grew to 101 episodes and I am almost into completely new material now. The revision dropped a few things and added a great deal. I now view Buffy's story as simply the neverending tale of her life - and elves live a long time. Speaking of my own story, let me thank you for reading it. I am so enjoying the insights you are providing! When working with your older episodes, don�t feel attached to any length cutoff points you may have had. That is, don't let long episodes simply grow. Don't be afraid to break them into post-sized pieces. As we have discussed, most of us find 1000-2000 words to be about ideal for a single post or episode. I am so pleased that you have joined us and are hopefully finding the warm support and encouragement of like-minded writers here that seems missing at the other forum. 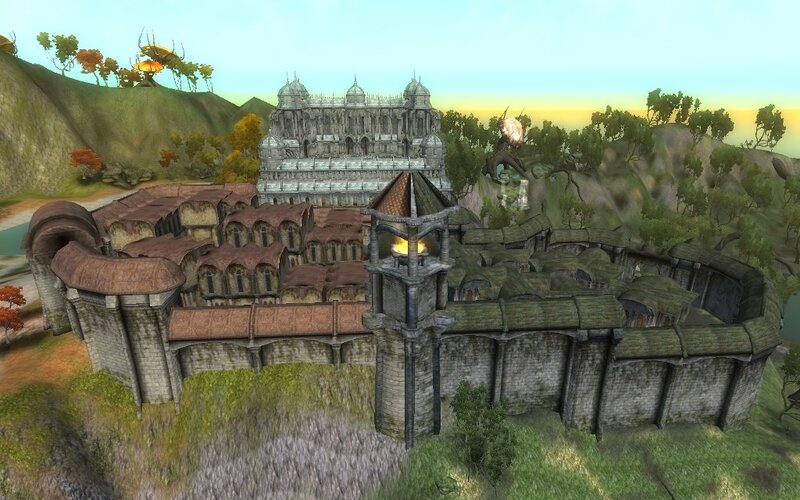 Nit- The Shivering Isles is a world like no other; a place of unsurpassed beauty and scores of adventure. Mixing plural (scores) and singular (adventure) at the end of this. Perhaps: 'scores of adventures' or 'abundant adventure' or maybe even 'unsurpassed beauty and adventure'.